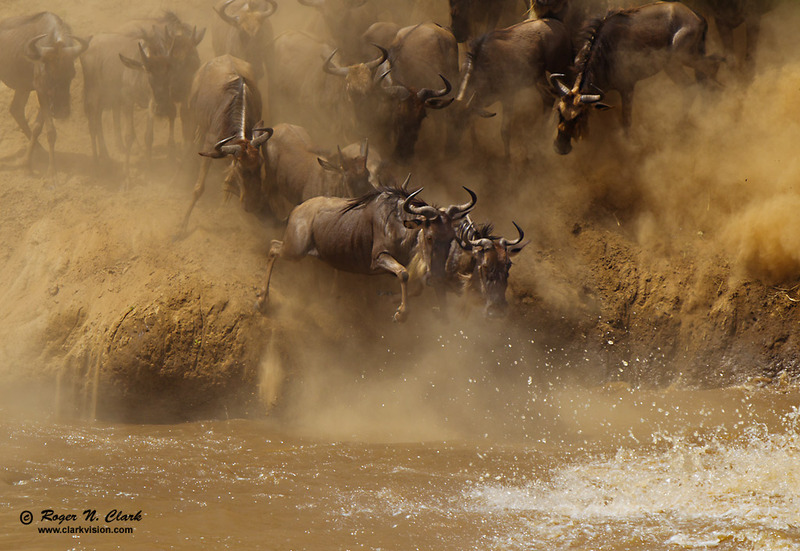 Wildebeest jump into the Mara river in Tanzania, northern Serengeti, in their annual migration to greener pastures. We were very fortunate to watch this mass crossing of the river with over a 1,000 animals. The three of us (guide +2 photographers) were the only ones there and in a perfect position. All the wildebeest who tried made it as no crocodiles showed up. About 10% of the herd did not cross. Technical. Canon 1D Mark IV digital camera, 300 mm f/2.8 L IS lens with 2x TC, working at 600 mm, f/6.3, ISO 200, 1/1000 second exposure. Exposure Program: Manual. Full height image, small (4%) crop off right edge.